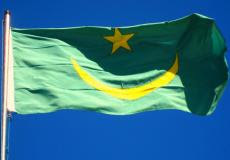 Mauritania has enjoyed a tumultuous time since gaining its independence from France in 1960. Ould Addah took on the presidency at independence, and formed the new nation into a one party state, arguing Mauritania was not ready for multi-party democracy. He was re-elected 3 times, until being ousted in a bloodless coup by the military. Another military coup followed (2), and led to Ould Taya being installed as president, a position he held as the nation transited from military to civilian rule. In 2003, there was an unsuccessful, but bloody, coup attempt (3). After ruling for 21 years, Taya was successfully ousted in another coup (4), which brought in a new constitution. Part of which limited the number of terms a president can serve. 2007 saw new presidential elections, only for another coup in 2008 (5), and finally, in 2009, a move back to civilian rule. Though it is by no means clear if it will work! Through all this, Mauritania has used the same flag all the time. There has been no changes to it. It was adopted back in 1959, and uses two of the colours of the pan-African movement, yellow and green. The flag itself is a green field, on which is a yellow star and crescent. 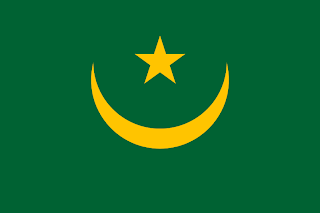 The green represents Islam, as does the star and crescent, and the yellow in the star and crescent represents the sands of the Sahara.